Capitalists@Work: Nanny State ? - Nein, Danke ! Nanny State ? - Nein, Danke ! Nothing much from me of late, es tut mir Leid: I am travelling rather a lot to a land where they take – what shall we say – a refreshingly robust attitude to ‘elf-n-safety’. In the picture below, taken from my eyrie above Düsseldorf, the little orange blob is indeed a man in a trench, unguarded from the main road alongside, and working in perfect harmony with the mechanical digger whose large steel arm is indeed hovering a couple of feet over his head, as it appears. His head, by the way, is not adorned with a hard hat (for which he would immediately be dismissed from a UK building site - & that’s before everyone involved in this jolly escapade was given their cards). He digs away with his pick: and when he has broken up enough soil, the digger grubs it up, swings its grab out across the road, through 180 degrees to the truck behind it. Sometimes bits fall out of the grab onto the road but no-one seems to mind. I reckon they dug 100 feet in 2 hours – and not a pneumatic drill in sight. A man then dragged by hand some plastic piping across the road from the lay-down area opposite: they joined it all up, and back-filled. Job’s a good ‘un. The traffic was never halted. No animals were harmed in the making of this film. I am going to take some pics of the remarkable, nay, lethal railway arrangements in this pleasant, prosperous town to illustrate my next missive. Last week, in Berlin in Kuerfurstendamm, a busy main street(like Marylebone Road), I observed two workmen burning white lines from the middle of the road. No miles of cones, no huge warning signs, no traffic lights, just getting on with it. The traffic moved around them smoothly and easily. Common sense ruled. The only concession to elf-n-safety was orange jackets. They quickly did their job, packed up and moved on. Can you imaging that happening in London? Not a single hard hat, safety line, high vis vest, and as far as I could tell not a single steel toe cap. Furthermore, as the job wore on numerous pieces of kit; drills toolboxes, jackhammers, everything was handed down level to level by its electrical cable. As far as I could tell, no eyes were pocked out, fingers lost or limbs lying around. If I did not know better it would have seemed the world moved on exactly as it would have but at a fraction of the cost and effort. Sorry ; ( i left out the first sentence, it was Holand and a team working on the town hall. you would be surprised what we actualy do get upto on site....elf and safety my arse. It would be interesting to know if Germany allows lawyers to work on a "no win no fee" basis. In many European cities, enormous trams (they are as large as our trains) trundle about the streets at considerable speed. There are no fences, barriers, warning signs, flashing lights, moronic recorded announcements, stupid beeping noises, or anything of that sort. The trams are quiet, apart from the occasional clang of a bell, so unless you're paying attention, you don't hear them coming. You pretty soon learn to pay attention. Oddly enough, nobody seems to get killed much, by these machines. I do sometimes wonder how this is going to go in (say) Edinburgh. I remember sitting on the Dumbo flying elephant ride at Disneyland paris, whose cabooses fly around gently some 15ft off the ground. I was actually seized with a mild panic when I noticed there was no chain across the entrance of this flying elephant. Before i came to my senses and thought "This is Disneyland! It has 10 million kids a year through here. If it really was a danger they would have sorted it." Do you remember in the early days of those trams the phasing was out. The vehicle traffic lights went red but the tram go signal had already come on. Many traffic light jumpers got a scare when a train shot inches in front of them. 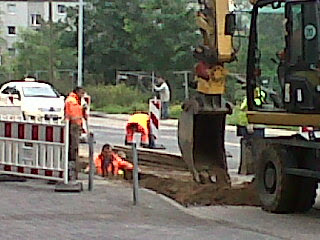 They're re-laying the street outside; just the two men. They've finished putting in the stone pavements and now they're doing the road surface with a machine as wide as the street. Lots of pedestrians on the one-person-wide pavements nipping round each other when they meet, stepping onto the road, watching the lovely road laying machine (Italians do like a machine to watch). The two men have just gone into the bar for a coffee but they should be finished by lunchtime. What are they wearing? Muscularly tight dark blue t-shirts and orange trousers rolled low at the waist - like in all the paintings really. We're all hanging out of the windows watching them. 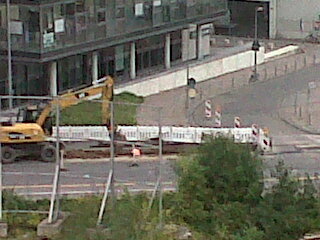 There's a man walking beside this huge machine neatening all the edges with a shovel now, quite invisible to the driver. On a related note - due to the high cost of labour in Scandinavia, automation in manual work intensive areas such as construction is rife. However, due to relatively low cost of manual labour and strong Unions in countries such as Germany, such tools either cannot be used legally (no joke) or are not worth the investment. So, rather than getting one of these (http://www.abelco.se/Tillbeh%C3%B6r/Rollertilt/tabid/221/Default.aspx) and two guys and get the ditch dug up and filled in a day, you get ten guys and get the same job done in a week. Go figure. Brilliant, thanks for that example. All goes to show.